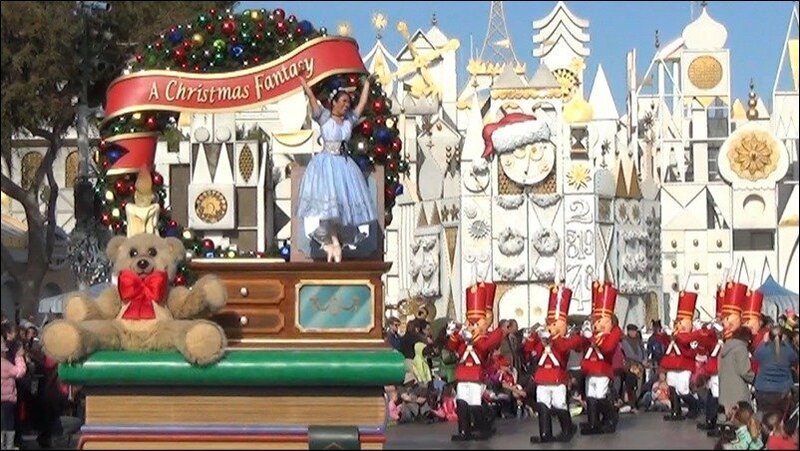 In a previous article, we discussed some of the magical ways you can celebrate the holidays with Disney, even if you can’t make it to the Parks. Now, we get to talk about all the fun things happening inside the Parks! We’re going to skip over Mickey’s Very Merry Christmas Party…for now, because that could fill an article all by itself…but trust us, it’s something you don’t want to miss!! 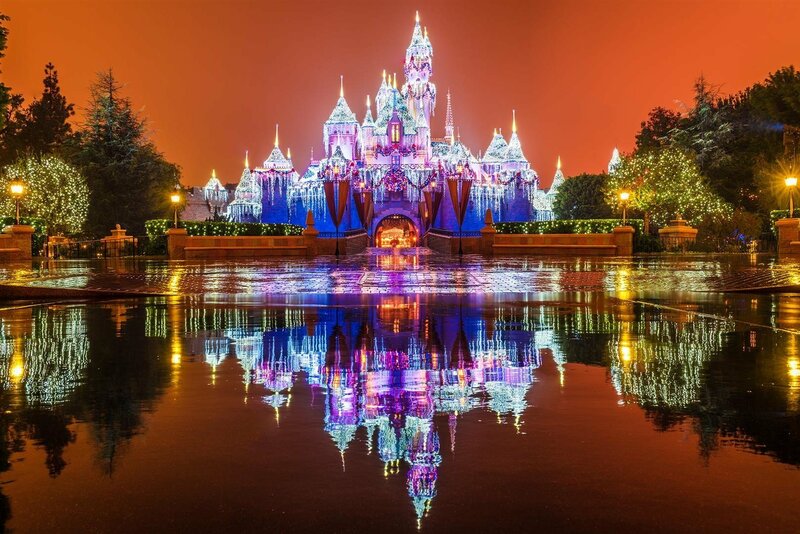 All over the world, Disney spreads a touch of Christmas magic at all its Parks, but it’s been said that no other theme-park can compare to the beauty of Disneyland for the holidays. At both Disneyland Park and Disney California Adventure, goodwill and holiday cheer fill the air everywhere you go. Disneyland does not hold back when it comes to spreading the holiday cheer. 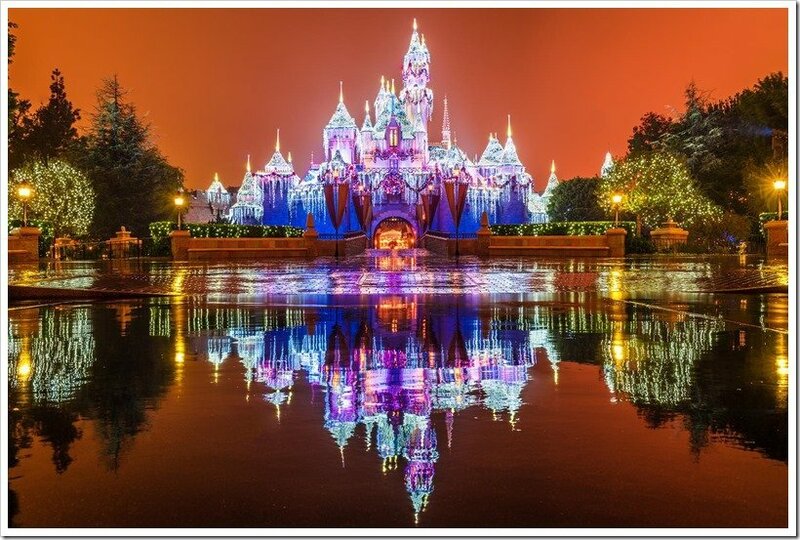 Sleeping Beauty Castle is breathtaking this time of year, covered in 80,000 LED lights and sparkling snow-capped turrets. In classic Disney fashion, the magic comes alive with a beautiful lighting ceremony, accompanied by a snowfall of gingerbread scented “snow”. Not only does the spirit of the season touch every inch of Main Street U.S.A., Adventureland, New Orleans Square, Frontierland, Fantasyland, Critter Country, Tomorrowland, and Mickey’s Toontown, but Disneyland goes above and beyond incorporating the Christmas theme into some of their most popular attractions as well. Something magical happens when Halloween and Christmas collide, and the result is nothing less than spectacular! 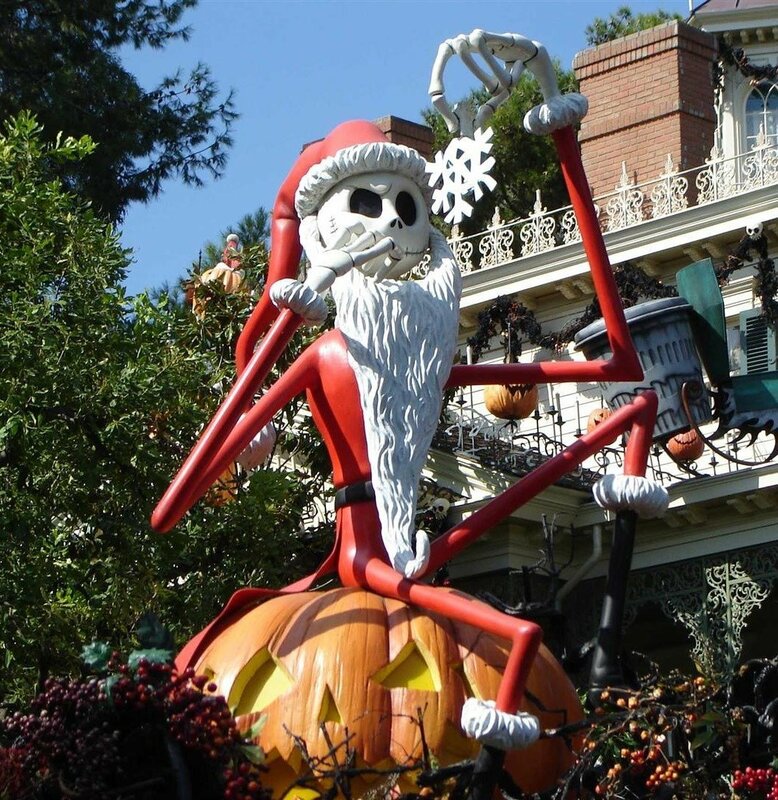 Inspired by Tim Burton’s The Nightmare Before Christmas, a Haunted Mansion Holiday takes over the classic Haunted Mansion attraction starting in the fall and carrying over to the winter months. 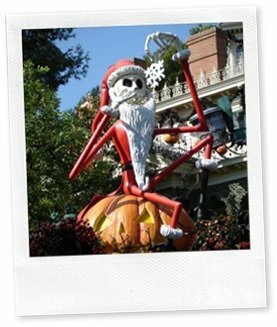 The entire Mansion is transformed as Jack Skellington (dressed as ‘Sandy Claws’) attempts to put his own spin on Christmas, going so far as to include a stunning gingerbread house display that fills the area with the smell of fresh baked gingerbread. It’s a “it’s a small world” Holiday” turns a Disneyland tradition into a winter wonderland, with snowflakes, icicles, the iconic Small World dolls singing Christmas carols, and a 14-foot tall snowman made of crystal snowflakes and thousands of lights. Outside, you’ll notice roughly a quarter-of-a-million lights twinkling, and that much loved Small World clock sporting a Santa hat of its own. The attraction makes the perfect backdrop for Main Street’s “A Christmas Fantasy Parade”, which is just one of the wonderful Christmas themed shows Disneyland incorporates into the magical experience. You won’t want to miss out on the “Believe…in Holiday Magic” fireworks display or a chance to meet Ole Saint Nick in Critter Country. 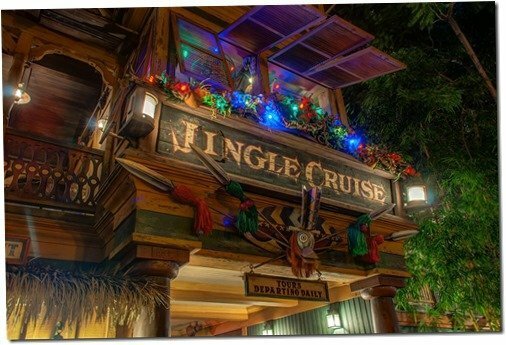 Don’t forget to book passage on the “Jingle Cruise”, where holiday cheer has spilled over the entire ride. Decorations and a new script filled with holiday jokes turn the already silly Jungle Cruise into a fun Christmas adventure! Disney California Adventure has some holiday fun all its own with sparkling lights, beautiful garland, festive entertainment, and even a special spot to meet Santa Claus! 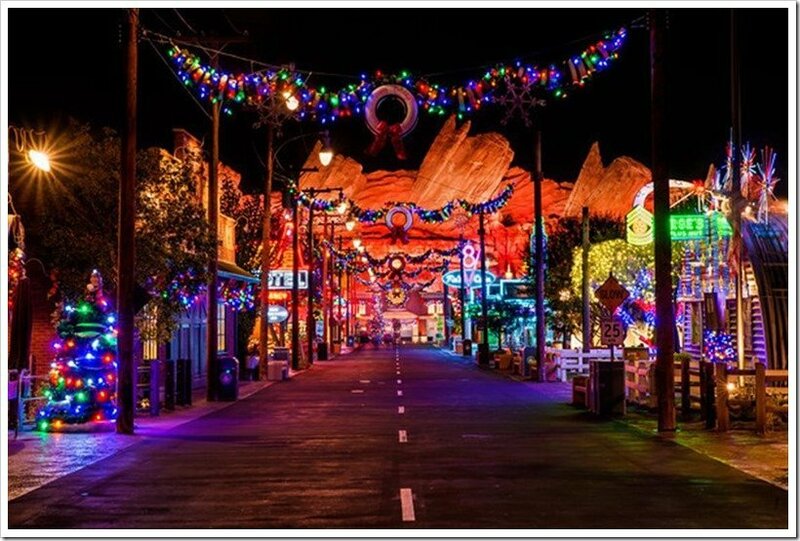 From the streets of Cars Land all the way to Buena Vista Street you’ll be met with all sorts of imaginative holiday decorations. 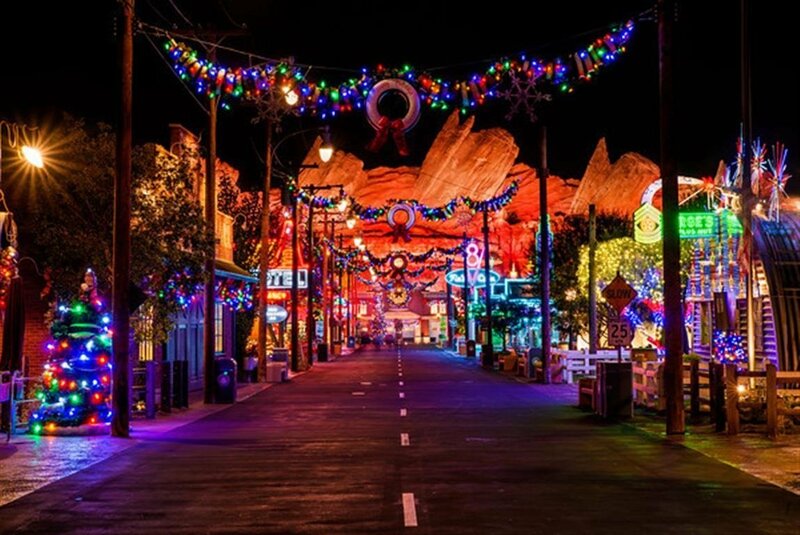 Route 66 features a “Cars” inspired Christmas tree, filled with tires, hubcaps, and traffic cones… all things you would expect from Lightning McQueen’s friends. To top it all off, you’ll find a ‘snowcar’ (because what else would cars build in the snow?). Buena Vista Street becomes home to bell ringers, carolers, and a beautifully decorates 50 foot tall Christmas tree. One of the most unique Disney experiences takes place in the Paradise Garden area, where a Latin American inspired holiday party takes place. “Viva Navidad” comes alive with a festive street parade, special meet and greets, and holiday food offerings. Want a chance to see real snow in California? Then you should make sure to swing by the “Olaf Snow Fest”, where kids can play in the snow and even meet a good friend worth melting for, Olaf! For a view of the rest of the Frozen cast, the “World of Color–Season of Light” show at Disney California Adventure is hosted by all your Disney favorites, and features a holiday spin on the regular show with Christmas music and a lot of cheer.